On August 14th 2014 12.50 pm PKR and DAP held a press conference where Datuk Seri Dr. Wan Azizah (ADUN Kajang) announced that 30 ADUNs supported the move to replace Tan Sri Khalid Ibrahim with Datuk Seri Dr. Wan Azizah. The ADUNs were comprised of 13 from PKR, 15 from DAP and 2 from PAS. This means that Pakatan Rakyat had the support of 30 / 56 ADUNs. The following list of tweets were the most popular responses to the announcement on Twitter between 12.45pm – 2.35pm, based on the data that we collected. On August 12th 2014 Tan Sri Khalid (Selangor Menteri Besar) announced that he had fired all six state executive councillors (exco) from PKR and DAP. This action followed the announcement by the six state executive councillors that all decisions made by the exco be put to a vote, in order to limit the functions of the Menteri Besar. Following this the exco chose to recognise the termination as illegal and pledged to continue working as usual. 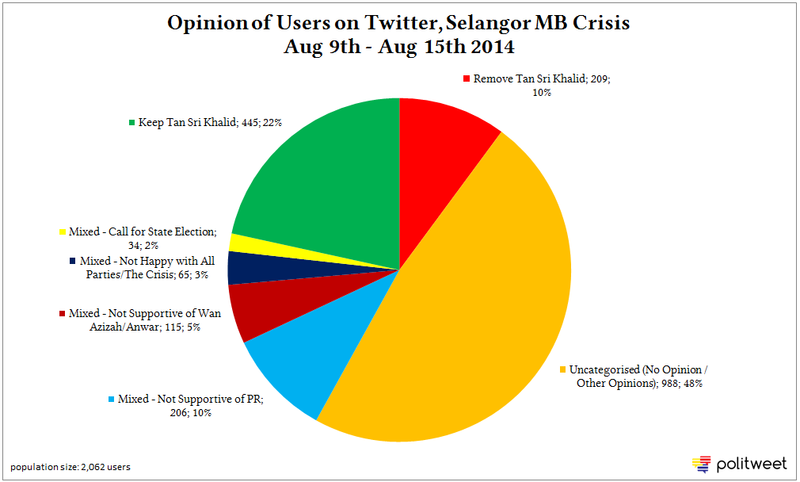 The following list of tweets were the most popular responses to the announcement of the termination of the state exco on Twitter, based on the data that we collected.